The next ceramic artist whom I want to invite into my “hus” (as you know, that’s “house” in Danish) because their story made an impression on me, is the young talented artist Katie Spragg. Katie graduated from BA (Hons) Wood, Metal, Ceramics and Plastics at Brighton University in 2010. I met Katie when attending a course in print making techniques at Camden Arts Centre where she was sharing her knowledge – and her stories of the curious and the bizarre. Inspired by stories in the Metro newspaper, Katie produced a series of plates, which depicted the tales of the bizarre behaviour of urban wildlife. For example, and one of my favourites, there was the story of the fox, which was found on the 72nd floor of the UK’s highest skyscraper and apparently was surviving off scraps of food left by construction workers. Katie has transferred her drawings onto digital transfers which she then adds to the plates. I personally enjoy the expressive and humorous nature of her drawing style which really goes well with these bizarre urban animal stories. Over the years, I have met many talented artists. Sometimes it's not just their work that makes an impression on me. At times, their stories stay with me too. I am going to share with you, the tales of some talented ceramicists whose stories made such an impression on me that I felt compelled to do a blog post about them. Besides their work is so beautiful that I had to invite them into my SkandiHus. First up is Luke Bishop. 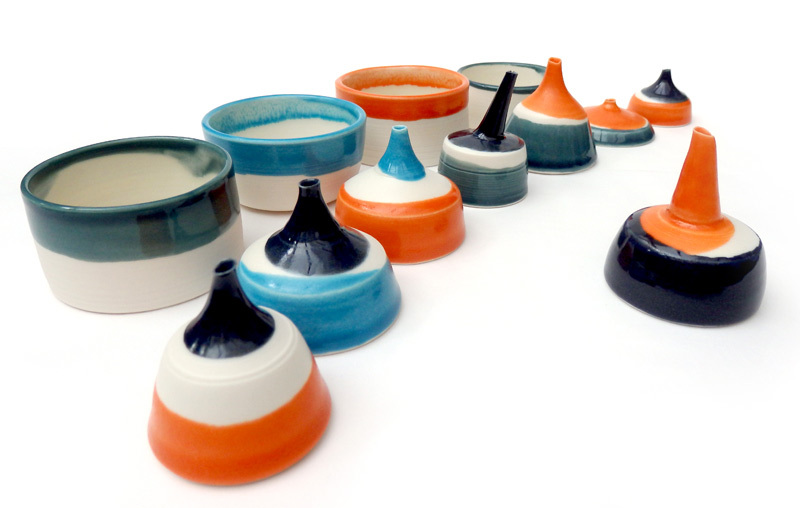 The lovely Luke Bishop completed the Ceramics HE Diploma in Ceramics at the City-Lit in July of 2013. His practice is founded in the language of function and the functional: wheel-thrown porcelain vessels and forms. Luke himself describes it as ranging from utilitarian to sculptural, inhabiting the region where Craft and Art collide and bump into each other. Functional forms are combined in abstracted groupings that might intentionally strip away function entirely, or perhaps augment it. When I met Luke at the New Designers show, he handed me one of his small beautifully crafted vessels that, at first sight, did not seem to have a function. Then he told me his story. The vessel was inspired by an old Roman tradition of catching tears in vessels. Luke explained how they used to catch tears of sadness and place them by the graves of the deceased. To him though, the tears that we may want to catch today could be happy ones too: "It could be a place to store the tears your shed at your daughter's wedding" he said but then immediately he looked across the table, his facial expression changing to a sad one. He pointed to a large ceramic vessel, saying that “perhaps that one should be dedicated to the people of Syria and the tears the world is shedding for them”. Neither of us said anything for a little while after this. I quietly put Luke's beautiful ceramic object back on the table, thinking that if I ever got married, I would buy one for my mum to eternalise her tears of happiness in. I left feeling. And that ability to make someone "feel" is to me the ultimately sign of an artist having succeeded. Luke, SkandiHus salutes you and your story.